The research presented in this paper is part of a larger study of the organizational impacts of information systems on knowledge work. The phase of the research reported in the paper explores current understanding of information systems implementation issues and asks whether it is adequate to effectively manage the wide range of IS that support knowledge work. Studies that have focused on systems that automate core business functions such as manufacturing, logistics, inventory management, and accounting have improved our understanding of both the range of issues involved and the factors most often associated with successful implementation. However this research questions whether such understanding is sufficient to optimize the use of knowledge assets in the modern economy. As organizations turn their attention to automating knowledge work, it makes sense to reexamine what we know about systems implementation and ask ourselves what new challenges this particular class of systems poses for organizational managers. 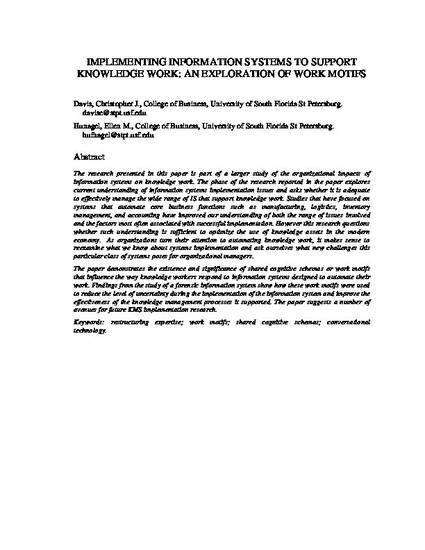 The paper demonstrates the existence and significance of shared cognitive schemas or work motifs that influence the way knowledge workers respond to information systems designed to automate their work. Findings from the study of a forensic information system show how these work motifs were used to reduce the level of uncertainty during the implementation of the information system and improve the effectiveness of the knowledge management processes it supported. The paper suggests a number of avenues for future KMS implementation research.